OLGA WAS SCHEDULED for a battery of cognitive tests at the Beckman Institute at the University of Illinois at Champaign/Urbana. But the flights in and out of there were tricky, so we built in a buffer day in Chicago. Before leaving we had a pow-wow of what she might like to do there. I encouraged her not to edit herself. It was wide open. A full day in one of the world’s great cities, a place bursting with peak experiences waiting to be had. Her choice, I reckoned, would tell me something about her strategies for squeezing maximum life out of this life. What was begging to be fed inside of her: body? Mind? Soul? Which of the three mortality-beating virtues – empathy, mindfulness, and gratitude – would she bring into play? I threw a few options on the table. There was a morning service at St. Joseph the Betrothed Ukranian Catholic Church – one of the most striking churches in the world and right up her street, theologically. She was lukewarm. She felt no need to get her attendance in; she’s in pretty good standing with her God. The Botanical Garden? Well, there are pretty great gardens in her own town. Thanks. The Field Museum, with its famous, fabulous T-Rex skeleton? Maybe if we had more time. She was keen seeing a Cubs game, but the team was scheduled to be on the road that day. So we pressed pause, agreeing to scout conditions and make the call on the fly. And come Monday morning, as the city heated up like a griddle, we ended up at the stone steps of the city’s great cultural jewel, the Art Institute of Chicago. Olga is a self-taught painter. As a girl she liked to park herself in the corner and quietly draw her family. (She once sketched her maternal grandfather, Michaylo, on a cold winter day with his feet up in the oven to keep them warm.) A number of her landscapes dot the walls of her granny-suite back in Vancouver. But she hadn’t painted in a long time. She hadn’t even set foot in a museum in years. The big showpiece exhibit was a Roy Lichtenstein retrospective: walls and walls of those one-panel cartoons, which left her cool. We skipped contemporary art altogether, moving briskly through ancient Eastern art, and modern sculpture. Even the art I felt sure would appeal to her — heroic religious paintings, folk art, the Renaissance masters – didn’t, particularly. Then we hit the Impressionists. And here, in the Monet room, Olga came alive. 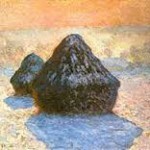 Monet invented “series” landscape art – the same subject captured over and over, on different days, in different seasons. In his river scenes, and in the famous water lilies in his backyard pond in Giverny, you can sense the furious intensity with which Monet tried to bag this moment, and then the next, and then the next. The master trying to catch time even as it slips through his paint-stained fingers. On the back wall were several of Monet’s wheatstacks. Olga stood transfixed before them. What was so arresting her? The glorious pastel colours of the changing sky? Partly. The part of her brain beyond words was soaking this up; and her eyes actually flashed a bit of annoyance when I kept yakking, breaking the spell. But at the same time she was working something out. It was the … architecture of that pile of wheat. She herself had stacked wheat, back in the day, on the Saskatchewan farm. And as she gazed at the paintings it all came flooding back: how the “binding” machine would leave a row of grain sheaves as thick as barrels; and how she’d carry one under each arm. She’d stack them upright against each other, on end. The idea was to made a little cone of them, like firewood, no more than six to eight to a bundle, and leave them like that to dry so they’d be ready for the thresher. And back then you knew they would dry. The weather was more regular then. Global warming, Olga mused, has messed with a lot of things you used to be able to count on. Olga nodded.” These look like muffins,” she said. Here’s what is tonic about spending the day with Olga. There is zero guile. There’s never any attempt to appear better, or other, than she actually is. It’s refreshing to spend days with someone who is not subtly trying to score status points. The arms race of cool is not part of her world. No one has yet tested how well “comfort in our own skin” correlates with longevity. But it probably does, if we can figure out how to measure it. October 15, 2013 February 26, 2014 Tagged: Olga Kotelko, What Makes Olga Run?